Somehow writing by hand is still the best way for me to summon inspiration. Ambiant llight, iridescent paint and polester (1,4 x 3 m). Variable Dimensions. 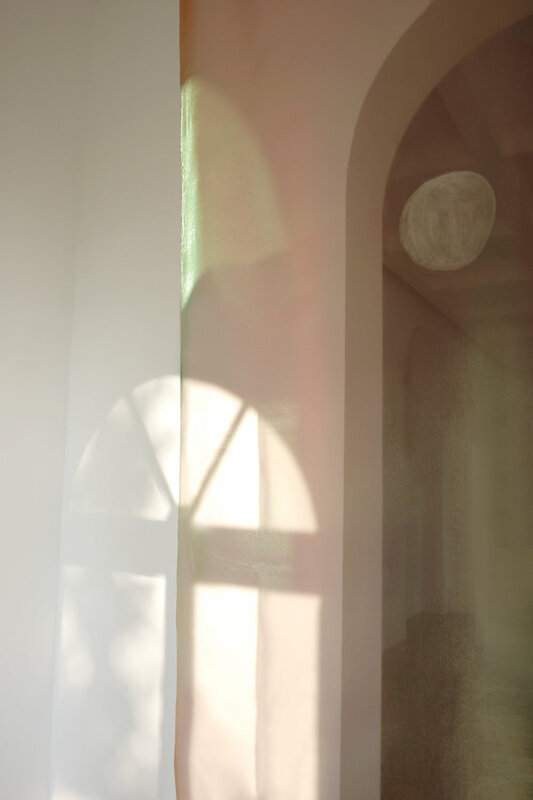 A translucent textile is suspended and constantly changing according to the quality of the light and the time of the day. The movements, sometimes caused by airstreams or the displacement of bodies, shake the shimmering colors. Only the outline of the painted heavenly body appears steady, possibly one of the Jupiters’ moons. This work was exhibited for the first time in front of a large window. Late afternoon, in belgian spring light, the sun drew shapes onto the fabric toward sunset. Iridescent hot stamping foil, glossy paper (70 x 100 cm) and magnets. Variable Dimensions. Foil stamping is a very precise printing process widely used in the industry. The heat press allows, for example, very neat shapes onto packagings or magazines. In this series of works, glue is poured generously onto the paper before the foil is placed on top. The glue is directed outwards by hand. Some aspects of the print are predicables, while the liquid friction is left to hazard and creates a different and unpredictable drawing each time.